The C.6 bus service runs between the airport terminal building and Alicante city centre every 20 minutes, 365 days a year. It also stops at the Renfe train station and other strategic locations around Alicante, connecting with TRAM lines 1, 2, 3 and 4 at the following stops: Alfonso X El Sabio, Plaza de los Luceros and Vázquez de Mella. * We recommend our users to pay the exact amount of their fare. In case they have not the exact amount. Maximum change: 10 €. For payments with notes of more than 10 €, the driver will give you a paper showing the corresponding return value to be submitted to our offices at Av. Denia, 155, where such amount will be paid to you. 7:00am- 7:20am- 7:40am -8:00am -8:20am- 8:40am- 9:00am- 9:20am- 9:40am- 10:00am- 10:20am- 10:40am- 11:00am- 11:20am- 11:40am- 12:00am-12:20am- 12:40am- 1:00pm-13: 20pm- 1:40pm- 2:00pm- 2:20pm- 2:40pm- 3:00pm- 3:20pm- 3:40pm- 4:00pm- 4:20pm- 4:40pm- 5:00pm- 5:20pm- 5:40pm- 6:00pm- 6:20pm- 6:40pm- 7:00pm- 7:20pm- 7:40pm- 8:00pm- 8:20pm- 8:40pm- 8:00pm- 9: 20pm- 9:40pm- 10:00pm- 10:30pm -11:00pm:- 0:00pm -1:00am- 2:00am-3:00am-4:00am -5:00am- 6:00am. I’m having trouble reading the timetable, what time is the bus leaving Alicante early morning, around 5am? Hear you hhave the timetable. Thank for contacting us. 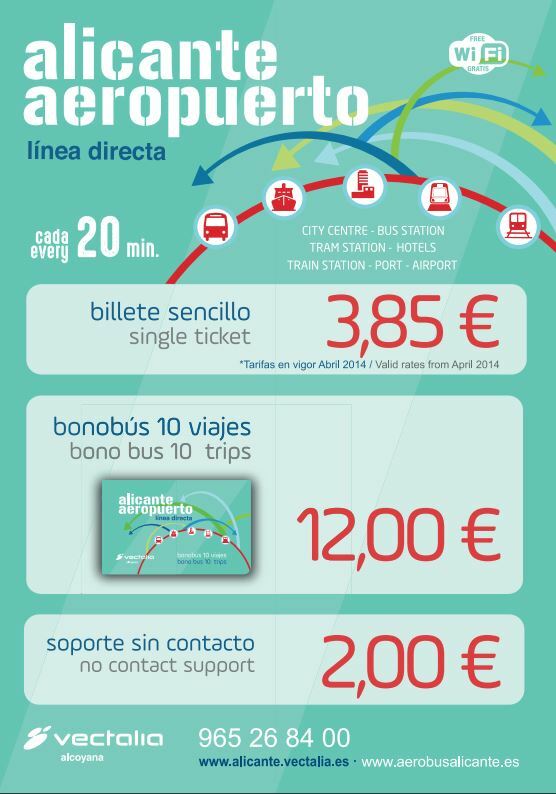 Do you have the timetablefrom bus C^from Alicante to airport and back? 7: 00-7: 20-7: 40-8: 00-8: 20-8: 40-9: 00-9: 20-9: 40-10: 00-10: 20-10: 40-11: 00-11: 20-11: 40-12: 00-12: 20-12: 40-13: 00-13: 20-13: 40-14: 00-14: 20-14: 40-15: 00- 15: 20-15: 40-16: 00-16: 20-16: 40-17: 00-17: 20-17: 40-18: 00-18: 20-18: 40-19: 00-19: 20-19: 40-20: 00-20: 20-20: 40-21: 00-21: 20-21: 40-22: 00-22: 30-23: 00-0: 00-1: 00- 2: 00-3: 00-4: 00-5: 00-6: 00. There are buses to the airport 24 h at day. Is it possible to have suitcases (20 kg) and golfbags (20 kg) with me at the bus? Is there a trunk, where they can be stored while driving? Dear Jørn Nielsen, is possible to get into the bus with suitcases and golfbags. You can carry your bags with you on the bus, but there isn’t a trunk. Hello, does anybody knows how long does the bus take to go from airport to the train station? Hello, and how long does the bus take to go from Alicante train station to the airport? The same 30-40 min or less if the bust goes in a circle route?